I have more Dance Legend polishes to show you tonight - Yippee. Tonight's polishes are from their Sahara Crystal collection, which currently has 23 shades of textured polishes. I originally was feeling some hate towards textured finishes. I really didn't think they would catch on and I certainly didn't think I would wear one. That was until I was sent the OPI Mariah Carey liquid sands to review. It completely changed my opinion about textured polishes. After that I bought a few of the Zoya ones - and desperately want to buy some more of the Zoya Summer Pixie Dust polishes too. I'm still not sure if I like regular creme sand effect polishes. I definitely prefer a sparkle in them and I think I prefer a matte finish to them too. Let's have a look at these Dance Legend ones. Malachite - Firstly, the thing that struck me with this polish is that in the bottle is has a stunning duochrome glass fleck that goes from green to purple (and can be easily seen in the third photo). 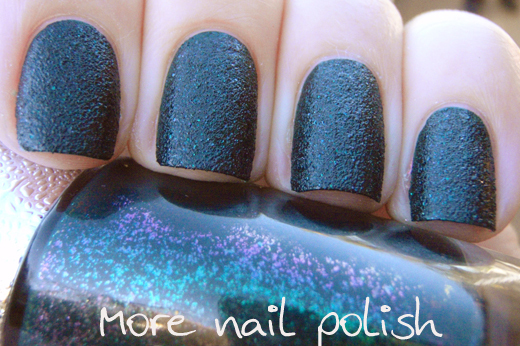 The polish itself is a blackened green and its very opaque. This was just one thickish coat of Malachite. Because it was only one coat, it dried much quicker that other textured polishes I've tried. I loved that the green glass fleck bits were still sparkly on the textured nail, although I wasn't really able to see the colour shift. I wanted to see what this one would look like with top coat (plus I wanted to see how many coats of top coat it would take) This is four layers of Seche Vite on top of Malachite. At the end of four layers the polish was 99% glassy smooth, plus you could really see the gorgeous colour shifting glass flecks. 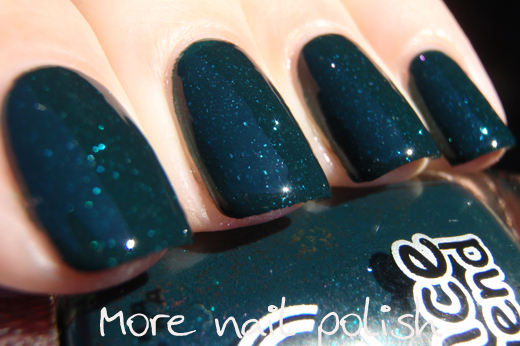 Dance Legend polishes are available from Dance Legend in Russia. The Sahara range polishes are $9.00 and worldwide shipping is available for only $10 or order 10+ bottles and postage is free. These polishes are really stunning. I need to look into this range, I'd never heard of the brand before! Can't believe you stayed steadfast through four layers of SV though, but it was totally worth it! Wow! 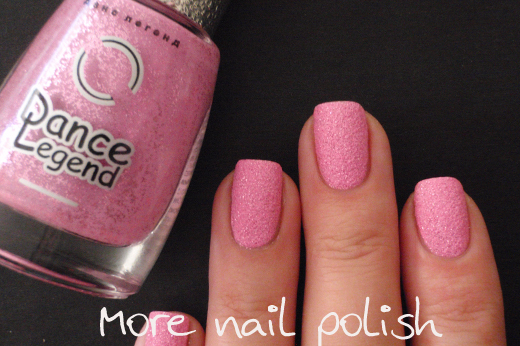 I love this pink! You have no idea how thrilling it is to see your native country brand get worldwide recognision! 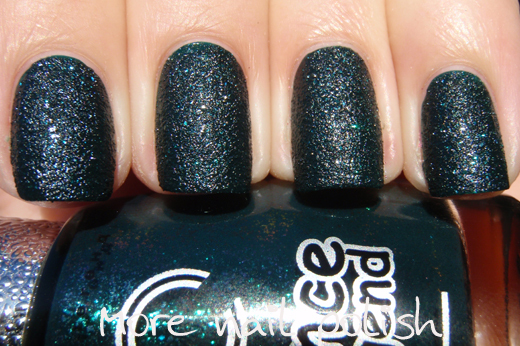 Malachite is hands down one of my most favorite Dance Legends (I currently have more than 30 DLs in my stash), anв I'm really looking into adding Sandy to it :) Great swatches! mmm - these are very nice! I like the textured effect best, I'm not sure I'd have the patience with four coats of SV - and I'd be worried about shrinkage with so much of it!